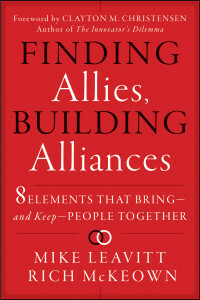 Finding Allies, Building Alliances is about how to create collaborative solutions to the greatest challenges facing businesses and industries today. Business challenges extend far beyond you and your firm to the competitors within your industry and the regulators outside it. Finding solutions to larger issues requires cooperation between diverse stakeholders, and in this rapidly changing world, only those able to adapt and network successfully will produce fast, competitive solutions. The book – which includes a foreword by Clayton M. Christensen, author of The Innovator’s Dilemma and How Will You Measure Your Life? — will help leaders successfully bridge divides and turn competitors into collaborators. How can leaders successfully bridge divides and turn competitors into collaborators? 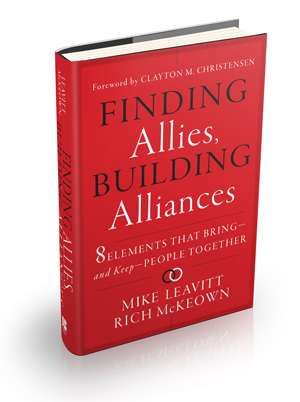 In Finding Allies, Building Alliances, Mike Leavitt and Rich McKeown explain how a well chosen network can become a powerful alliance. They provide a framework of 8 elements that will help any leader foster and maintain an effective, productive venture. Whether you’re launching a new partnership, or rehabilitating one already in progress, Finding Allies, Building Alliances will help you find workable solutions to the most complex problems and boost competitiveness and resilience. 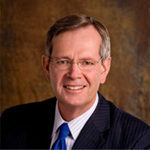 Mike Leavitt is the founder and chairman of Leavitt Partners, where he has advised clients since 2009 in the practice areas of health care, environment, and trade. 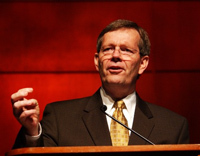 Previously, he was in public service for 16 years, most recently as Secretary of Health and Human Services in the Cabinet of President George W. Bush (2005‐2009). 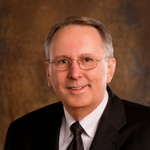 He has also led the Environmental Protection Agency (2003‐2005) and served three terms as governor of Utah (1993‐2003). Rich McKeown is the president, CEO and co‐founder of Leavitt Partners, where he leads teams that help clients enter new markets, enhance product value, and navigate regulatory systems. During his tenure as chief of staff at the department of Health and Human Services, he managed the day to‐day activities of 67,000 employees with a budget in excess of $740 billion and led landmark food safety negotiations between the FDA and the Chinese government. Comments posted on FindingAllies.com are moderated. While we certainly welcome the dialogue that comes from the blog format, it’s our obligation to ensure this site’s content remain helpful, informative and professional. You can judge for yourself what that means in terms of a comment you’d like to submit, then we’ll judge. And hopefully we’ll be in agreement. We won’t edit comments, so it’s an all or nothing sort of deal. Thanks for reading, visiting our site and participating here with us.